and then there was the event . . .
sigh . . i love knit nation. 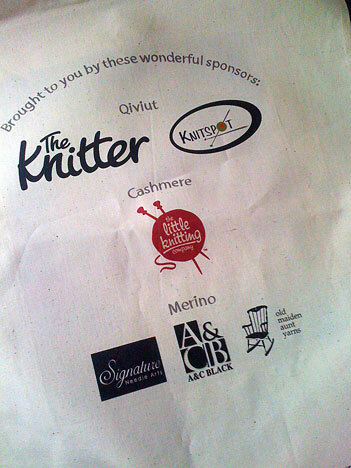 i’m so sad it’s over; it was, once again, a really REALLY fun event, attended by sweet and enthusiastic knitters from all over the globe. 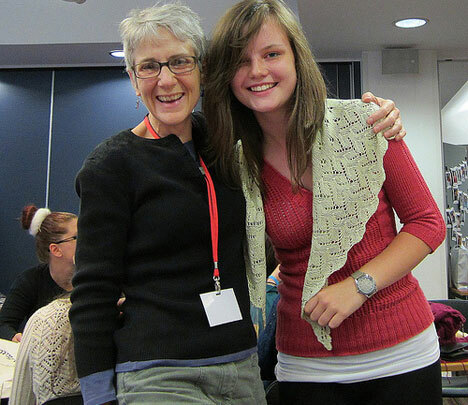 that’s me with our friend helen, who many of you know as josiekitten. 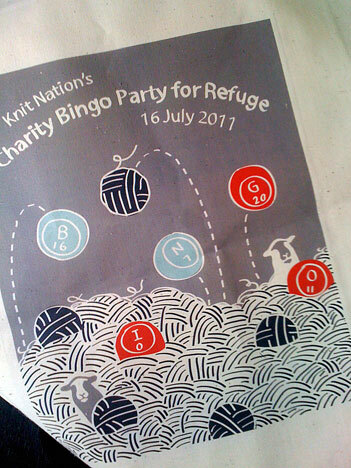 we are waiting for the doors to open on charity bingo, the saturday evening event to benefit refuge, which knitspot sponsored. it was an uproariously fun evening and a brilliant success. not only did we raise a bunch of money for this good cause, but it turned out to be an opportunity for an impromptu meeting of the UK branch of our fall in full color club—also in attendance were janet, gina, rose, with cameo appearances by hattie, sandy, and of course socktopus and cookie. in addition to sponsoring the event, we also donated two prizes, including my sample knit of the budding apple shawlette in kollage creamy, which was won by lily (i feel awful that i don’t know her ravelry name, but i hope she keeps in touch as she is a wonderful designer herself). the other prize was a full membership to our fall club, but unfortunately i never did get to meet or take a photo of the recipient. where loads and loads of beautiful british wools abounded. i was sorely tempted, but caught myself in the nick of time—i was already traveling very close to the limit of my luggage weight (i’m not sure how that happened), so i’m being very careful—i wanted to be sure to have room for belgian chocolate . . .
but still, i’m kicking myself; i wish i had purchased some shetland yarn form well manor farm and anything from john arbon. so yes, my teaching weekend was filled with several intense, all-day classes that i think were really great. at least, it seemed so from my side of the desk and i hope all the participants felt the same. 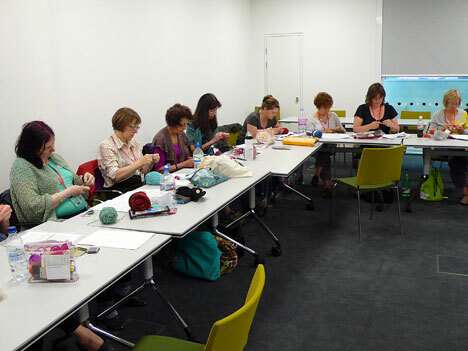 we had an absolutely wonderful finishing class on saturday and advanced lace on sunday. which included a lovely sampling of handmade items—yarns, a sardine-shaped lavender sachet (my favorite, hee-hee! 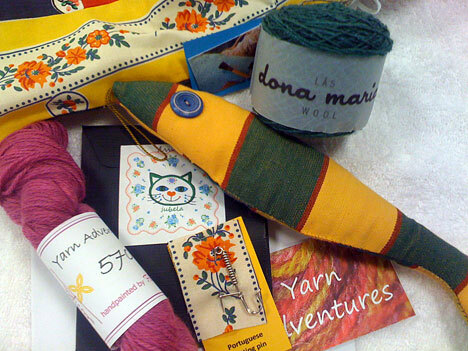 ), a portuguese knitting pin, and a hand embroidered knit pin tucked into the kitten envelope; everything presented in a pretty hand sewn bag. such a lovely gift—thank you ladies! sunday provided another chance to get together with the norfolk knitters for a cozy lunch in between their classes with franklin habit and cookie. 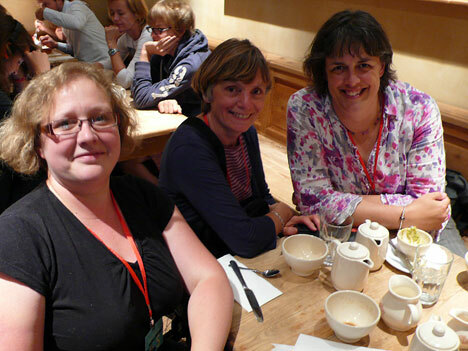 we did an awful lot of laughing in between delicious bites of LPQ soups and sandwiches, mmm. and we managed to dry out a bit from the drenching we received while running between raindrops to get there. the weather this last week has been chilly and drizzly wherever i go—where london was quite warm last year for the event, apparently that was very unusual. this year is more the norm. that said, i have still managed to get out daily for a nice walk or run—i have not sloughed off in the least (i do miss my bike very much, though . . . and even more, i miss my evening rides with david). these photos were taken during a pause along the flower walk in kensington gardens, which was very close to the knit nation venue at imperial college. i went out every morning at the crack of dawn, which seemed to be the secret to hitting the best weather of each day—i managed to stay dry on all five days i went out; there was one morning that i didn’t go because of the rain. 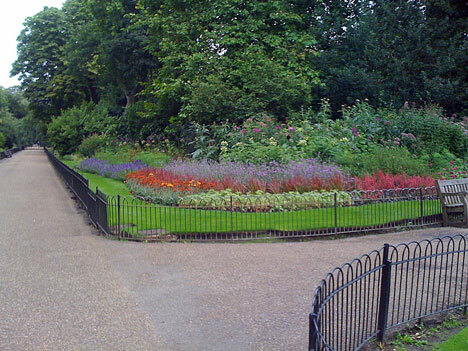 i also went out along the thames path from alice’s flat yesterday morning and crossed over into the battersea park. i didn’t take photos, but you can see some of that walk from my february post about the same route. so yeah, the running program is going well—yay. no more evidence of the ankle/lower leg issues i had in may, phew. i’m almost up to running a continuous 30 minutes—i can run 40 minuttes, but not all at once; i still need a couple of walk breaks in there. but i love it and that’s the best part of all. now i bet you’re wondering where all the knitting is, right? which is almost to the underarm already, woo-hoo. this is such a pleasure to knit; i’m still saving it for a treat between reaching other knitting goals, but it’s coming along, which tell you that the system is working for me. here’s a closeup of the shaping . . .
which on this piece, will converge onto one of the single knit tbl ribs. 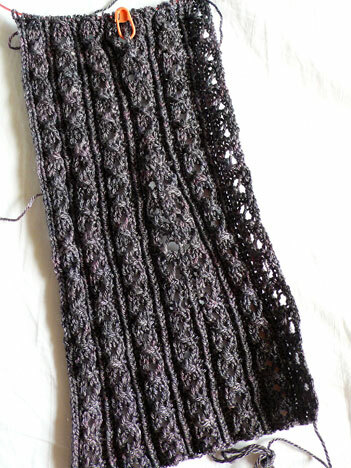 it’s working out really well—the way that the pattern diminishes and then expands again looks very good in this position. yay. so even the knitting is good. while i haven’t had much of a chance to work on patterns during this trip yet, i’m hoping to squeeze in some of that between now and sock summit. even a little bit would be good. i have the rene sweater pattern back from proofreading now and the whitfield shorty is ready to go as well; i just need some spare time to devote to them. 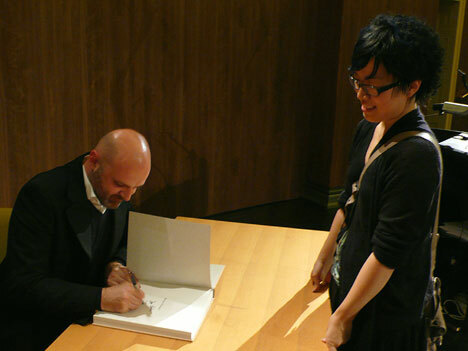 cookie and i had a rare opportunity to see one of our design heroes last night—hussein chalayan gave a talk/interview at the V&A in london and we managed to snag tickets to see it—we even got to sit in the front row. she actually changed her flight back to the states so we could attend and then continue on to belgium (where we are now) to see a knitwear exhibit in antwerp. so now here we are in brussels; we got in around noon today and explored the city center this afternoon with alice and carol. tomorrow is a national holiday with all sorts of citywide festivities, including a parade that passes right by our hotel at 3 pm—we’ll get to see the king! i have lots of pictures to share from the chocolate museum and the brewers museum, as well as from our long walk. but i’ll have to prepare those for another day—it’s very late now and we are past tired. on friday we travel the short distance to antwerp to visit a fashion exhibit and shop around a bit—more from that stop and the rest of this one in a few days. til then, have fun and be good! i’m trying to convince david to take some pictures of the garden in my absence and do a little post or two so we can all keep up together—hopefully, we can talk him into it. oh it looks as if you are once again having a blast. and i am the lucky lucky owner of a magnificent chalayan coat that i never could have afforded at barney’s but snagged it at century 21 at about 10% of its retail price!!! so great that you got to see him. AND tada i am the biggest bingo lover. used to play every week when we lived in washington, dc – so love it that this was a charity bingo!! enjoy and come home safely. Anne, like all your posts, this is so generous of you to share this amazing trip with us. I am loving every detail and picture. But I must say — the “star” of this post is the decrease detail. Shaping so cool I can’t wait to try it! What a wonderful trip you’re having, Anne. I’m so happy things are going so well for you and that you’re getting to hang out with fans and friends on both sides of the Atlantic. Your photos, as usual, have me wishing I was there with you. I may have already found some yarn that is going to become Blumchen. Just saying…. It looks to be Lily France of Wray cardigan design fame from The Knitter magazine (UK) issue 25. So glad you are having a lovely trip! The knitting pin is very interesting–I had heard about Portuguese knitting a while back and was wondering what the heck those pins looked like. Now I know! Lily is lilykate on ravelry and her mom is minder; their blog is called Joli House. Sounds like a great event! So envious. LOVE!!! Wish I was with you girls! hussein chalayan!!! i didn’t think i could be more jealous than i already was over knit nation!! Oh didn’t we have fun?! 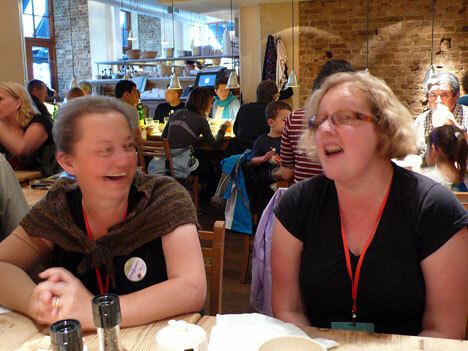 Yarn, good food and friendship – what could be better?! Safe travels Anne. I’m interested in hearing more about the chocolate!! Your trip sounds fantastic! Just after Christmas last year, we stopped off in London for a couple of days before going up to Scotland for my husband’s family reunion. I stashed away a lifetime’s worth of yarn, knowing that when I handed out the batik cottons that I brought over for my hubby’s cousins (fantastically enthusiastic new quilters), there would be plenty of room for lots and lots of (wool) fibery goodness. Not much room for clothes, but the relatives were awfully generous and shared things that I didn’t bring (or wouldn’t have even thought of bringing). 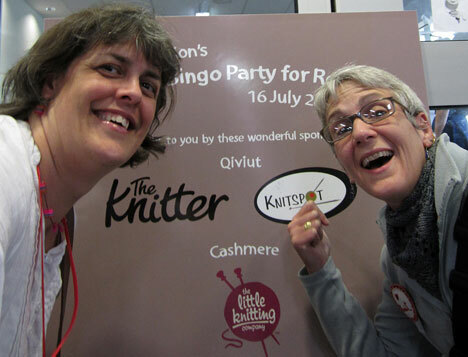 Knitnation was great – and it’s interesting to see your pictures, everybody has different impressions, and met up with different people. Enjoy Belgium! (despite the weather) – and I hope we can catch up. oh how magic! what a wonderful experience for you all. Hope you are reading in David :), we would love to see your post from the garden. take care & safe travels home. Wonderful pics, as usual! I Love the garden paths. It sounds like such a great time. Thank you so much for sharing a peek at KnitNation – it looks like another fabulous time – the museum, the gardens, the coffee (yum) – and the yarn. Oh, my. Eagerly awaiting a Belgian chocolate post. I read about the Antwerp exhibit in Yarnlot’s blog (http://yarnlot.blogspot.com/) – it looks FANTASTIC. I bet you’ll love it. 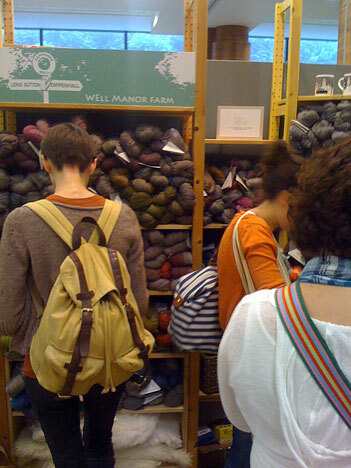 The Yarnlot blog is great, too -she doesn’t post often, but she takes wonderful photos of amazing places. 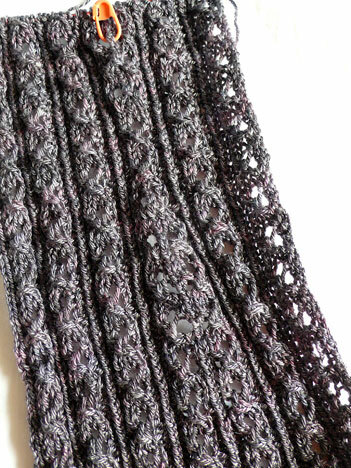 Woop woop I got a mention in the KnitSpot blog! It was great to see you Anne, and safe trip home. 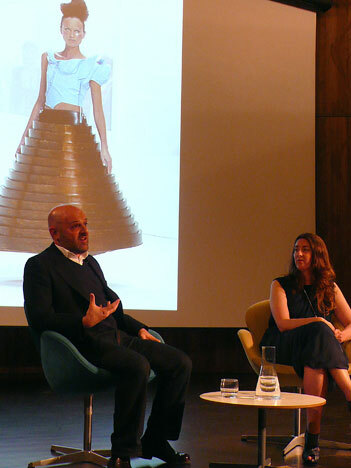 And Hussein Chalayan is great and a brilliant designer – I interviewed him a few times at London Fashion Week back in the days when I was a journo (and went to his shows). 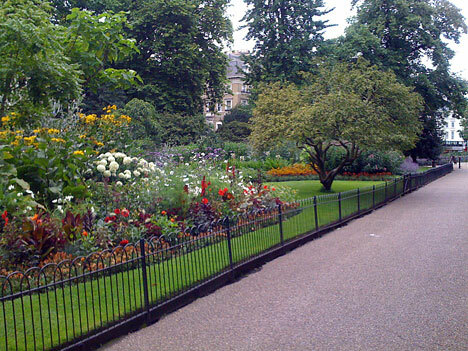 The gardens are absolutely gorgeous on-line; I can’t imagine how beautiful they are in person! Can’t wait to see your sweater in person! Safe travels and loads of fun! All I have to say is have a Belgian waffle with chocolate, strawberries and whip cream!! sounds like it’s been a great time and fun. David – yes, we need posts of the home garden! Thanks for your patience Anne in your Advanced Lace class (I was the one who asked lots of questions)! I learned such a lot – the other day I managed to read my own knitting and fixed a dropped YO 🙂 And thanks for showing us your swatches, yummy yarniness and very educational! I was surprised to see that you’re a fellow ‘thrower’, I’d assumed that being a designer you’d knit Continental for the speed. Glad you enjoyed your European tour so much. Thanks for sharing your trip and have a good journey home!